After the men in Once Upon A Time In Mumbaai last week, the women in Aisha are in the focus of limelight this week. As expected, the film didn’t have a grand opening. Having an average start, it was supposed to manage to scrape through at least. The opening of a new movie is always expected to hover around the 50% mark and this is what happened with Aisha on the day of its release at multiplexes in major cities like Delhi, Mumbai, and Bangalore. Punit Malhotra who’s just helmed a hit for Karan Johar’s Dharma Productions is hoping someone would notice him and cast him as a leading man next. “I won’t cast myself in my next directorial project. I can’t direct and act together. But I’d like to act in a film. An actor is what I came here to be”, says Punit. Shahid and Sonam Kapoor are shooting love scenes in a specially-designed carriage in a part of Edinburgh where no film has been shot before and with equipment, the ultra-sophisticated Jimmy Jib crane, never used in a Hindi film before. Feeling flush with the success of I Hate Luv Storys (IHLS) – her first hit – Sonam Kapoor returned to Scotland last week to resume the shooting of Mausam with Shahid Kapoor, who had been patiently waiting for his heroine to return so they could resume their-onscreen romancing for his father’s film Mausam. Coincidentally, a week after IHLS clicked, Shahid’s Milenge Milenge opened to a very lukewarm response. Naturally, Sonam and Shahid had a lot to say to one another during the breaks between shots about their respective films. Except that Shahid was doing all the talking about both films. Says a source from the unit, “Sonam and Shahid have been shooting this week at the Royal Mile which is the longest road in Edinburgh and not open to traffic, let alone film shootings. It’s a long stretch with restricted movement for locals, so that there was little intrusion from Shahid and Sonam’s Indian fans”. Cars filled with loads of NRI fans have been arriving in Edinburgh from in and around Scotland and London to see the two stars shoot. Says the source, “Naturally without fans hovering to take pictures and start off a conversation Shahid and Sonam were much relaxed at the mythic Royal Mile. 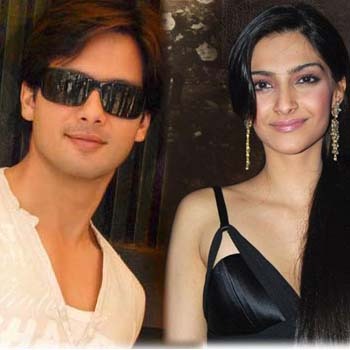 Shahid had a field day taking potshots at his own film and congratulating Sonam for her success”. Apparently, Shahid insisted on addressing himself as ‘Flop Hero’ and Sonam as ‘Hit Heroine’. Says the source, “After a point, Sonam just told him to stop it. But Shahid was unstoppable”. Imran Khan and Sonam Kapoor can heave a sigh of relief. Despite a terrific weekend that boasted of 23 crores coming in, there were cynics who were waiting for I Hate Luv Storys to fall on weekdays. Bandh on Monday didn’t help the cause as theaters were closed till evening. Despite that the reception continued to range between decent and good. Approximately 10 crores were added in the next four days that resulted in a collection of nearly 32 crores for the film in the very first week. These are good collections by industry standards and instantly put Imran and Sonam in the top bracket. The benchmark of 50 crores seems a clear possibility for I Hate Luv Storys. It is a hit affair for Dharma Productions and UTV Motion Pictures.With this latest hit they would be willing to forget the debacle of their earlier project Kurbaan. Also, in one stroke the film has ended up doing much better business than Wake Up Sid which was again a Dharma-UTV collaboration. Yes, there are voices around I Hate Luv Storys that label it as clichéd and just a repackaged affair going right due to some aggressive marketing and promotion. However, when instant coffee is the name of the game and movie making strictly stays a business affair, a fast inflow of cash is the demand of the situation. In that context, I Hate Luv Storys has done truly well. The film is expected to have some positive impact on the future projects of Imran and Sonam which are Break Ke Baad and Aisha respectively. Of course, it’s the product that ultimately matters, something which many actors would agree (Salman Khan’s Main Aurr Mrs Khanna came after Wanted, Ranbir’s Rocket Singh – Salesman of the Year came after Ajab Prem Ki Ghazab Kahani). However, it’s the general positive energy in the air that counts and for both Imran and Sonam this is something that would indeed matter most. ‘I Hate Luv Storys’ had everything going in its favour and that showed in the way it opened at the box office. As predicted last week, an opening of more than 70% was pretty much on the cards and this is exactly how the collections stood. With the opening weekend business being huge (~23 crores) and next only to the likes of ‘Raajneeti’, ‘Kites’, ‘Housefull’ and ‘My Name Is Khan’ this year, ‘I Hate Luv Storys’ brought smiles back on the faces of those who were looking for feel good entertainment. Karan Johar and Co. has cracked it well with I Hate Luv Storys. The romcom is basically a packaged affair. Despite a thin storyline it has clicked at the box office with mega collections coming in over the weekend. Producer Karan Johar is, of course, happy with the state of affairs and clearly understands the factors that led to the film’s big opening. Talking about the dramatic elements that fill the second-half of the film, Karan says, “Yes, there was a little bit of drama but nothing was melodramatic or unusual. Everything happens as it does in the real world”. On a parting note, one can’t help but ask Karan if he too truly believes that love stories in today’s generation have actually moved on from what they used to be a decade ago. “That’s right”, admits Karan, “My parents saw a different kind of romance on screen. Later in 90s, there was a different syntax that came in. Today, it is different altogether. For quite some time, there wasn’t a love story which was reflective of today’s time. IHLS managed to fit that bill and hence it succeeded”. With I Hate Luv Storys being the flavour of the season and brickbats still coming in for a debacle called Raavan, the newer releases were royally ignored. Films like Krantiveer – The Revolution and Mr. Singh Mrs. Mehta were never expected to change the face of Indian cinema. But the least that the makers would have expected was to have a face-saving release, if not an opening. I Hate Luv Storys has released and opened to a very good response all over. This also means that Sonam Kapoor now has a definite hit up her sleeves more than two years after making her debut with Saawariya and following it up with Delhi 6. Now that this Punit Malhotra directed film had made an impact amongst the youth, one can’t help but ask Sonam whether IHLS intended to break the cliché of conventional love stories? Boy hates mushy love stories, doesn’t believe in love and all those things that come along with it whereas the girl is a big believer in romance and is living her own perfect love story with a childhood pal. Boy meets this girl and don’t get along but eventually love strikes! First for the girl but the boy rejects it explaining that he only thought of her as a friend. Soon love strikes him too but by then it is too late. He tries to woo her back and ends up doing all those mushy things that he hated in the first place. 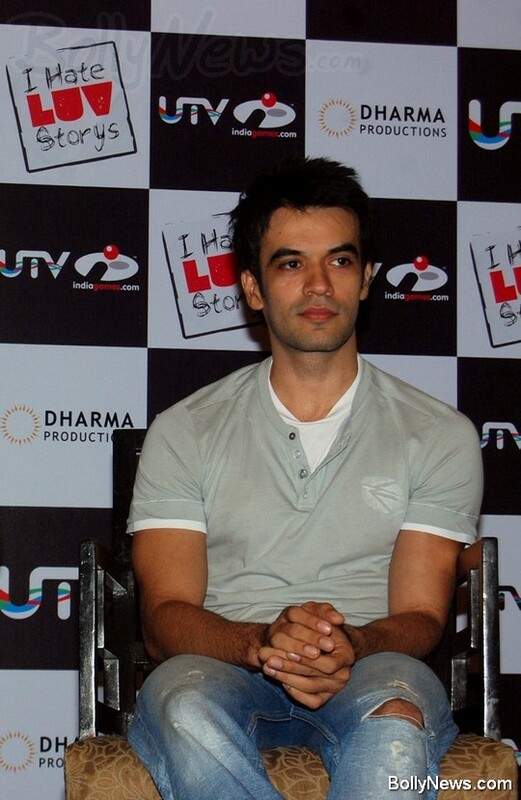 Punit Malhotra’s debut directorial venture, I Hate Luv Storys works well when it tries to poke fun at these elements but eventually falls in the same clichéd trap when it comes to delivering as a film. I Hate Luv Storys’ main lead character, J (Imran Khan) tries to poke fun of all the mush and romance ideas that generate from Bollywood. Ironically, working with Bollywood’s King of mush, filmmaker Veer Kapoor, he barely manages to keep a straight face about all that’s happening around him. A complete opposite of J, Simran (Sonam) joins Veer Kapoor’s production as a set designer. As expected clashes take place between the two but eventually they end up becoming good friends. Gradually she ends up falling for, Mr. Wrong at the risk of dumping her loyal perfect Mr. Right Raj (Sammir). J rebuffs her. Hurt, she tries to get over her fixation for J and decides to concentrate on her relationship with Raj. But by then J has fallen head over heels in love with Simran and wants her back. How he tries to use all the tricks from the clichéd Bollywood references and much more to woo Simran back, forms the rest of the film. First timer, Punit delivers big when it comes to giving the film a fresh treatment in terms of narrative and style and laces it with some extremely laugh out loud one liners. But as a writer, he falls short of offering anything new when it comes to the script. Agreed, it tries to take a funny look at the romance seen through the typical eyes of Bollywood, by doing a parody of sorts on filmmakers. He includes his own producer Karan Johar, Sanjay Leela Bhansali and even Aditya Chopra in it but one fails to understand why Punit doesn’t give a new perspective about the same in his own film given the resources he had in hand. The jovial first half has its moments but the second half tends to drag, especially since you can predict well in advance how and where it is all heading. But, full marks to his actors including the periphery ones, who keep it rocking with their perfect acts. Vishal and Shekhar’s chart topping music also aids IHLS and lifts it above the average. The innovative production design works well with the theme of the film. Ayananka Bose continues to surprise with camerawork with each passing film. She has captured the New Zealand locales superbly. Imran Khan, after a lackluster performances in Kidnap and Luck is back in top form and very much at ease playing a rom com lead. He adds more fun to his character with his body language and facial expressions. Sonam Kapoor is aptly cast as the dreamy lover girl and wows in her more contemporary city gal avatar unlike her first two films Saawariya and Delhi 6 which presented her in a more ethnic way. The chemistry between this fresh pairing is amazing. Kavin Dave as Imran’s office colleague is hilariously good. The graffiti on his Tees make you LOL as well. Sammir Dattani delivers his lines monotonously. Perhaps he was asked to appear as a boring boy friend. But he does it well. Sameer Soni is fun with his take on Karan Johar and so is Aamir Ali as the hot shot romantic star of the film he is shooting. Bruna Abdullah is smoking hot in her special appearance as Imran’s flirt interest. IHLS is fun till it lasts but once you come out of the cinema hall you realize that it fails to make an impact as a romantic comedy thanks to the feeling of déjà vu. IHLS works as pure popcorn fun.